Whether you’ve mastered the craft of classic cocktails and are looking for a new challenge, or you’re a die-hard DIY-er with a boozy streak, creating flavored syrups is a simple way to take your cocktail-making game to the next level. Syrups do more than just sweeten; they add body, provide balance, and flavored syrups lend complexity to cocktails. 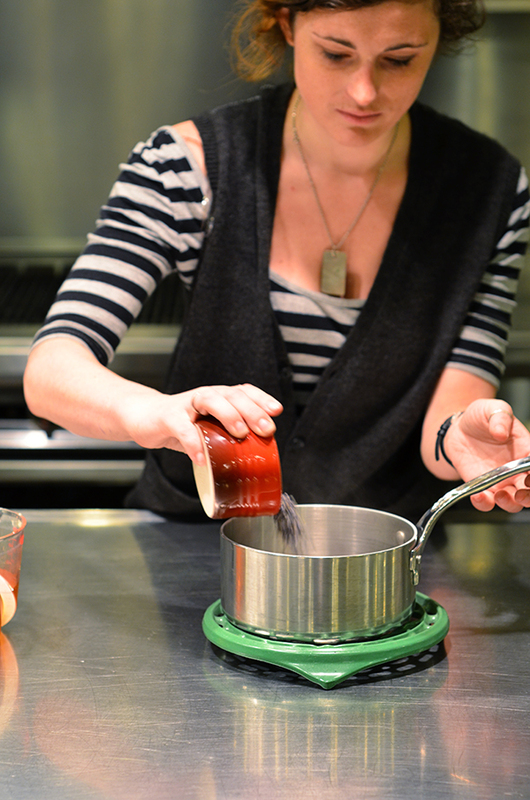 Here are some guiding principles to making syrups of all sorts, and a recipe to get you started. Once you know the formula, it’s easy to play around with different variations on a theme. The rule of thumb is that if you are using a granulated sugar (white sugar, turbinado, demerara, palm sugar) make your syrup equal parts sugar to water (1:1 ratio). If you are using a liquid sweetener (honey, maple syrup, agave), make your syrup twice as much of the sweet stuff as water (2:1 ratio). Liquid sweeteners already contain moisture, so you don’t want to overdilute, otherwise you’ll get a watered-down cocktail. 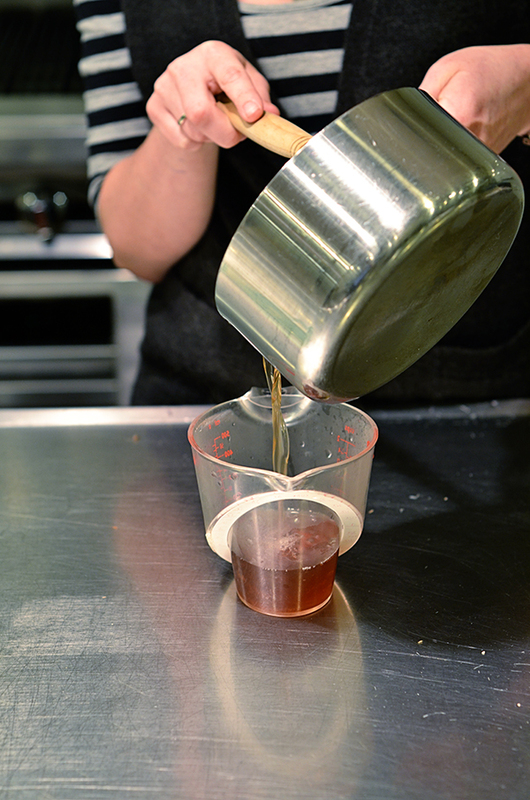 When a recipe calls for “rich” syrup, it usually means a 2:1 ratio. 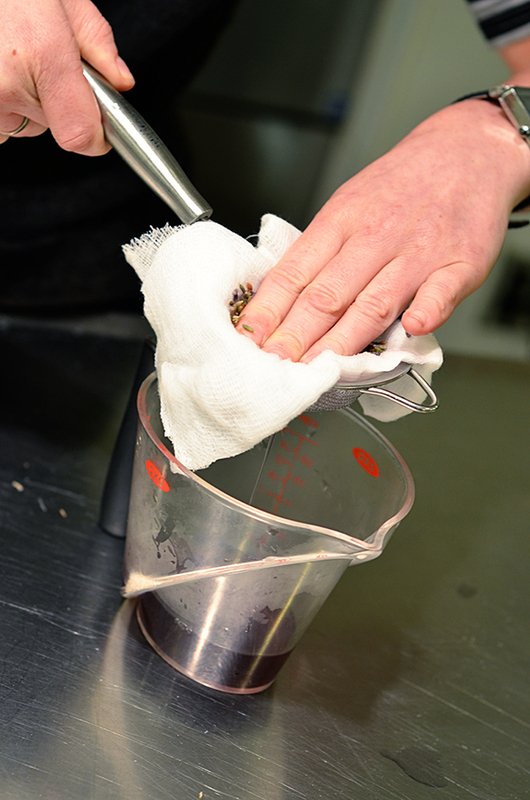 Syrups are particularly great because you can make them like the pros and “batch” ahead of time. If you’ll be using them right away, most syrups will keep for a week or so in the fridge. They’ll also hold frozen for several months. My preferred method is to pour syrups into an ice cube tray and freeze (one cube is approximately one ounce, or fill using a jigger for more precise measurement). Once they’re frozen, you can pop them out and place in a labeled plastic bag. Melt them individually for a nightcap, or all at once for a pop-up cocktail party. As mixologists will tell you, there’s never really anything new under the sun. That’s why so many turn to flavored syrups to freshen up old standbys. Substitute ginger syrup in an Old Fashioned, or rosemary syrup in a French 75, for a fresh interpretation. And for the teetotalers in our midst, flavored syrups are a great way to make sophisticated “mocktails” with sparkling water or juice. 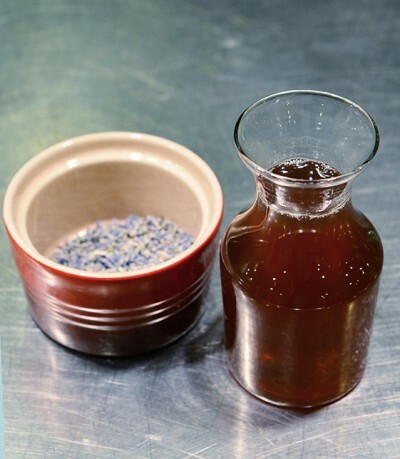 Honey lavender syrup is perfect in a Bee’s Knees, but is equally delicious soaked into pound cake, or added to Prosecco with an orange twist. Equipment: A small saucepan, liquid measuring cups, a silicone spatula, cheesecloth or a fine chinois, a heat-proof and non-reactive container for storage. 1. 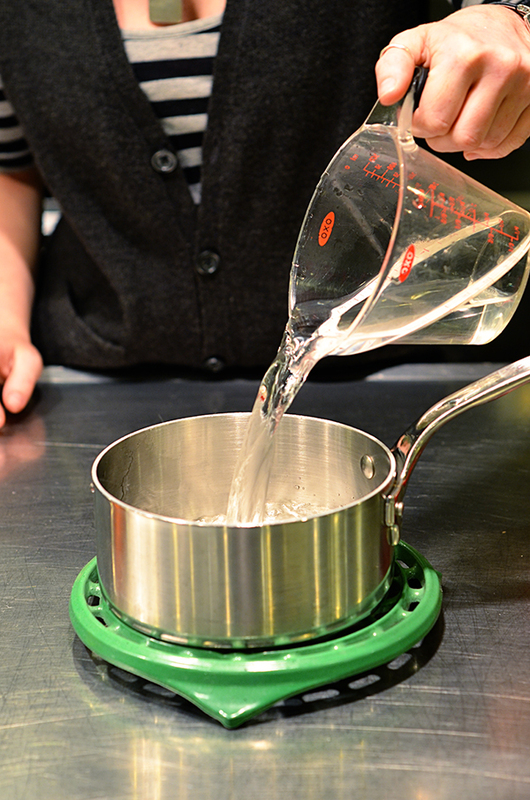 In a small saucepan, bring the water to a boil. 2. 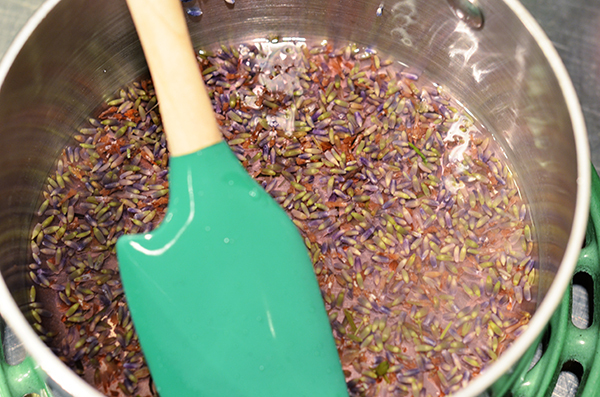 Remove from heat and add the lavender, stirring to immerse the petals in the hot water. Let steep (this is essentially a lavender “tea”) for about 10 minutes or until the lavender is fragrant and the water takes on a lovely purple shade. Taste for desired potency. 3. Prepare the strainer or cheesecloth. Using both is the easiest method (as pictured here), but you can also loosely stretch a damp triple-folded sheet of cheesecloth over the top of a small bowl and secure with a rubber band for a makeshift strainer. 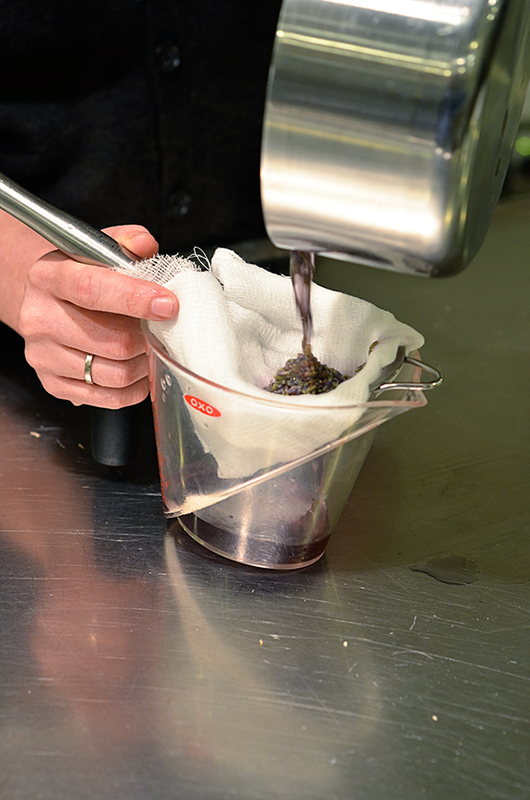 Strain out lavender buds, gently squeezing the cheesecloth to wring out any extra water. 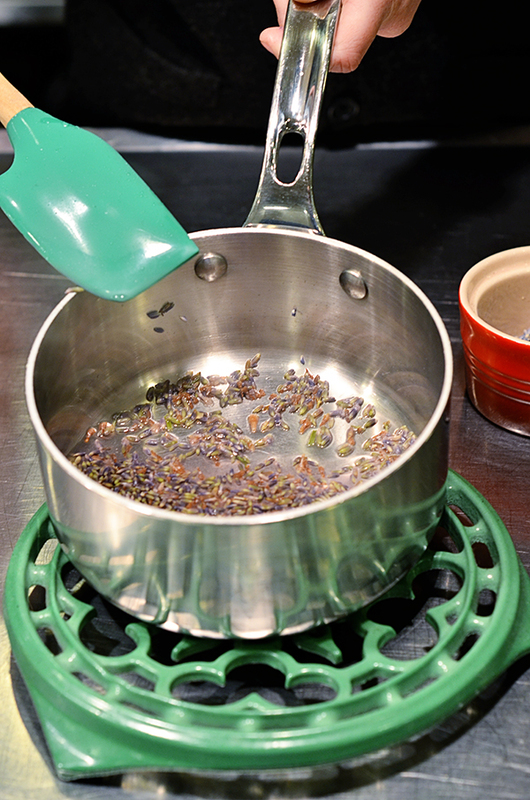 4.Return the lavender “tea” to the saucepan and add the honey. You may need to return the pan to low heat for a moment or two, stirring until honey and water are fully mixed. 5. Remove from heat and transfer into a heat-safe, non-reactive container (for storage, an airtight vessel is highly recommended). *You can use this same recipe with other dried spices, teas and woody herbs, varying the quantity based on the aromatic potency of what you’re using. As a rule of thumb, dried herbs are more concentrated than their fresh counterparts, so use less. If you’re interested in learning more about using syrups in cocktails, come join us at Astor Center for our Cocktail Chemistry: Syrups & Infusions class with April Wachtel.